Valery Gergiev’s inspired leadership as Artistic and General Director of the Mariinsky Theatre has brought universal acclaim to this legendary institution. With the Mariinsky Valery Gergiev has toured in over 45 countries and this year celebrates his 30st anniversary as Artistic director as the Mariinsky celebrates its 236th season. 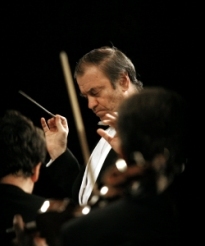 Born in Moscow to Ossetian parents, Valery Gergiev studied conducting with Ilya Musin at the Leningrad Conservatoire. At age 24 he won the Herbert von Karajan Conductor’s Competition in Berlin. He made his Kirov Opera debut one year later in 1978 conducting Prokofiev’s War and Peace. He was appointed Artistic Director and Principal Conductor in 1988 and General Director of the Mariinsky Theatre in 1996. In 2003 he led a considerable portion of St Petersburg’s 300th anniversary celebrations, conducted the globally televised anniversary gala and opened the Carnegie Hall season in New York with the Mariinsky Orchestra. In 2006 he opened the Mariinsky’s new Concert Hall. With its acclaimed acoustics the hall rapidly became a leading international venue for both performances and recordings made under the Mariinsky’s own label, launched in 2009. In May 2013 he celebrated his 60th birthday and opened Mariinsky II, a state of the art new opera and ballet theatre that makes the Mariinsky one of the largest cultural complexes in the world. Since then the Mariinsky’s responsibilities have expanded to include the Primorsky Stage in Vladivostok and both the newly opened State Academic Philharmonic and the State Opera and Ballet Theatre in Vladikavkaz. In September this year Valery Gergiev conducted the opening concert of the new Zaryadye Concert Hall in Moscow with the Mariinsky Orchestra and Chorus and international stars including Anna Netrebko, Ildar Abdrazakov, Daniil Trifonov, Denis Matsuev and Pinchas Zukermann. In December 2017 Valery Gergiev led the celebrations of the 85th birthday of composer Rodion Shchedrin. Mariinsky performances included Shchedrin’s operas Dead Souls, The Lefthander, Christmas Tales, Boyarina Morozova, The Enchanted Wanderer and Not Love Alone, the ballets Anna Karenina, Carmen Suite and Little Humpbacked Horse as well as numerous symphonies and concerti. 2018 focused on the anniversaries of two artistic colossi of the Mariinsky Theatre – 200 years since the birth of Marius Petipa and 125 years since the death of Pyotr Ilyich Tchaikovsky. In addition to his position with the Mariinsky Theatre, Valery Gergiev is Music Director of the Munich Philharmonic Orchestra, Music Director of the Verbier Festival Orchestra and Honorary President of the Edinburgh International Festival. He is Founder and Artistic Director of the Gergiev Rotterdam Festival, the Mikkeli International Festival, the Moscow Easter Festival, Stars of the White Nights Festival and ‘New Horizons’ on St Petersburg. Since 2011 he has been co-Chairman of the Tchaikovsky International Music Competition.